"In her first memoir, New Yorker cartoonist Roz Chast brings her signature wit to the topic of aging parents. Spanning the last several years of their lives and told through four-color cartoons, family photos, and documents, and a narrative as rife with laughs as it is with tears, Chast's memoir is both comfort and comic relief for anyone experiencing the life-altering loss of elderly parents. When it came to her elderly mother and father, Roz held to the practices of denial, avoidance, and distraction. But when Elizabeth Chast climbed a ladder to locate an old souvenir from the “crazy closet”-with predictable results-the tools that had served Roz well through her parents' seventies, eighties, and into their early nineties could no longer be deployed. While the particulars are Chast-ian in their idiosyncrasies-an anxious father who had relied heavily on his wife for stability as he slipped into dementia and a former assistant principal mother whose overbearing personality had sidelined Roz for decades-the themes are universal: adult children accepting a parental role; aging and unstable parents leaving a family home for an institution; dealing with uncomfortable physical intimacies; managing logistics; and hiring strangers to provide the most personal care. Roz Chast reads from Can’t We Talk About Something More Pleasant? at 2014 NBA Finalists Reading from National Book Foundation on Vimeo. 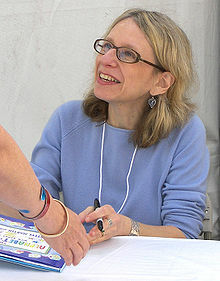 "Roz Chast has loved to draw cartoons since she was a child growing up in Brooklyn. She attended Rhode Island School of Design, majoring in Painting because it seemed more artistic. However, soon after graduating, she reverted to type and began drawing cartoons once again. Roz Chast has been making America laugh out loud since 1978 when she began drawing for The New Yorker. In her cartoons, illustrated books, and graphic memoirs (her latest, Going Into Town: A Love Letter to New York, comes out October 3), she deftly chronicles the oddball nature of being alive in a universe overflowing with strange human beings behaving strangely (and also normally, whatever that is). Her work runs the gamut from poking fun at the madcap among us to darkly hilarious renderings of tombstones, weird signage, turns of phrase, widgets, and life at home and on the city streets. You name the thing and Chast has likely skewered it. Again and again, she trains her sharp, self-aware eye on the absurd and the ridiculous, but with that comes an empathy for a topsy-turvy, hysterical, awkward, and (at times) unpleasant world. Her words and images have the ability to reflect back a society that often makes little sense. At the same time, her cartoons document and celebrate people doing ordinary things, which in her hands become extraordinary miniature portraits of the mundane. In this audio piece, among other things, we learn how she joined The New Yorker’s staff and how her illustrations are infused with a particular kind of anxiety. Additionally, visit the NEA Facebook page to see a few choice cartoons by Chast as she discusses them. You'll get to "Meet Mr. Twitters," "Donna and the Disasterettes," and learn about her very first and very strange New Yorker cartoon, which was controversial in the late 1970s. Oh, and she really, really likes drawing robots. Here are some examples of her doing what she does best and her design of the 2017 Library of Congress National Book Festival poster. The festival is September 2 in Washington, DC at the Convention Center. To learn about the NEA's amazing Poetry and Prose stage, go here. Theories of Everything: Selected, Collected, & Health-Inspected, 1978-2006. 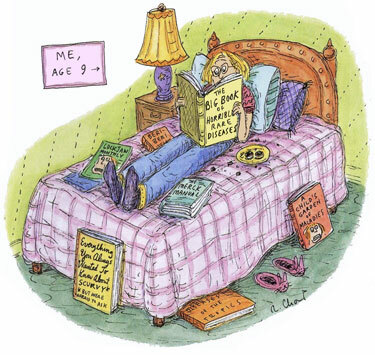 Copyright 2006 Roz Chast. Reprinted by permission of Bloomsbury. from The New Yorker. Copyright Roz Chast. 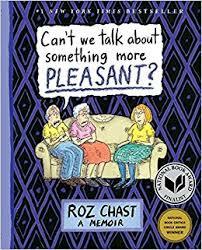 These discussion questions are designed to enhance your group’s discussion about Can’t We Talk About Something More Pleasant?, Roz Chast’s graphic memoir about the death of her parents. About this book Through words and illustrations, with evident pain and remarkable humor, Roz Chast revisits the struggle she went through with her aging parents as their physical and mental abilities gradually declined and they eventually became unable to care for themselves. 1. Have you had a similar discussion with your parents and/or children about aging and long-term care plans? What was the result? At what age do you think parents and children should have this conversation? 2. Which part(s) of the book, if any, could you relate to the most? Did you find yourself empathizing more with George and Elizabeth, or Roz? Did this change as you progressed through the book? 3. Which aspects of the role reversal Chast depicts—the child assuming a caretaker role—were the most striking to you? What emotions did you experience as you were reading about the challenges Roz, George, and Elizabeth all faced? 4. Did you enjoy Chast’s technique of telling her story through illustrations? Why or why not? Were there scenes in the book that you thought were more or less effective because they were depicted in cartoons rather than in straightforward text? Which ones, and why? 5. Whose experience is more frightening to you—George and Elizabeth’s, or Roz’s? 6. Which parts of the memoir made you laugh? Which made you cry? Did Chast’s use of humor surprise you? Do you think it’s necessary or inappropriate to approach this type of subject with humor? 7. In the chapter “The Fall,” would you have done anything differently than Roz did? Who did you sympathize with the most in this section? 8. Did your perceptions of George and Elizabeth as parents, spouses, and people in general change as the book went on? If so, in what ways? 9. Were there scenes in the book that you found exasperating? If so, which ones and why? 10. What do you think George and Elizabeth would think about the ways in which they’re represented in the memoir? 11. In your opinion, what is the greatest loss that George and Elizabeth experience as they age? 12. Have you considered your own end-of-life plans? Why or why not? Was the book informational for you, and if so, what did you learn? Has reading this book changed your thinking about your own end-of-life care? 13. What is your opinion of Roz’s decision to keep her parents’ ashes in her closet? 14. Chast discusses at length her complicated feelings regarding her mother, and how her relationship with her mother differed greatly from the one she had with her father. Do you think this has an impact on Roz’s approach to her parents’ end-of-life care? Do you think Elizabeth was a good mother? Do you think Roz was a good daughter? 15. Toward the end of the book, Roz struggles with the financial cost of her mother’s care, compounded by the fact that she’s “not living and not dying.” What are your views regarding this hardship, and her mother’s condition? There is a distinct sense of place throughout Chast’s memoir, beginning with a description of her parents’ Brooklyn neighborhood (p. 12), followed by a description of the interior of her parents’ apartment and the homes to which they eventually have to move. How does Chast depict each place? Did some of the details surprise you? To what degree does each place of residence influence or magnify each character’s personality and relationships? Do you think your place of residence influences you? Chast is known, among other things, for her wry, poignant, and often absurdist portrayals of existential questions and anxieties, some of which she illustrates in what she calls “The Wheel of Doom” (p. 29). To what extent do you think Chast’s—and her parents’—anxieties drive the tone and direction of the book as it unfolds? Do you or members of your family share any of their particular anxieties? Are you familiar with assisted living? If so, is your perception and/or experience with it similar to Chast’s, or do you share George and Elizabeth’s perception of it (p. 95)? Chast uses humor to delve into an often dark and distressing subject. How would you describe her style of humor? In what ways does her use of humor affect how you experience and relate to the story? In the section titled “The Old Apartment” (p. 105), Chast describes the accumulated objects that her parents hoarded for decades and left behind. Why do you think she decides to “rescue” the items that she depicts on p. 119? Do you or your family possess objects that have never been thrown away? What are the stories behind these objects and why do you think they remain? Chast chronicles the complicated relationships she had with her parents with disarming honesty and unflinching candor. In what ways did her relationship with each of her parents differ? Did these differences affect how she related to them at the end of their lives? Do you think Chast’s feelings toward her parents evolved or changed in some way over the course of writing the book? Did yours change over the course of reading it? Did you find the portrayal of Chast’s parents sympathetic? Relatable? Do you think it would change your reading of the book—and your perception of these characters—if they were fictional? Chast tells us that her parents weren’t able to meaningfully connect with other residents at the assisted living facility in part because they had spent so much time alone with one another, isolated from the world at large (p. 131). Do you know others like this? What are some of the reasons that people may feel isolated in today’s society? Do you think the experience of aging will be the same for future generations? It’s not uncommon for the roles of parent and child to reverse as we age, i.e., our parents take care of us in our younger years; we take care of them in their senior years. This transition, however, is rarely simple or seamless, as Chast illustrates on p. 146. How would you describe that transition in this story? Have you experienced or witnessed a similar transition in your own life? If so, how does it compare to Chast’s experience? Aging for some can be a complicated, expensive, unpredictable, drawn-out journey. In retrospect, what preparations could Chast and her parents have taken to lessen the burdens that they encountered? Has reading this memoir changed your thinking about your own end-of-life care or that of your parent(s)? How much have you planned for, or talked about, aging in your family? In the last section of the memoir, just before the epilogue, Chast shifts from comic-style drawings to crosshatched, realistic sketches of her mother’s last moments (p. 211). Why do you think Chast chose to mark these moments in a different drawing style? Chast tells her story in graphic memoir form, using handwritten (as opposed to printed) words, as well as visuals such as color and gray cartoons, photographs, and pencil sketches. Why do you think Chast included each element? Would your impression of the book be different if it did not have some or all of these visual elements? It is often said that the act of writing, particularly a memoir, is an act of discovery. What might Chast have discovered about herself in writing this book? Join us for a movie and discussion. All times are 11 am to 1 pm. More movies to come in 2019!